William Coombe Addy who lives in Highland Park New Jersey in the US, contacted us about the descendants of Henry Coombe. Henry was a brother of Samuel, father of Jane Jacka (nee Coombe) and grandfather of Rose Martin (nee Jacka). Like Samuel, Henry was a miner in Frogpool who married and raised a family there (The Complete History, Chapter 4). Henry married Mary Trevena in 1837 and their oldest child who survived to adulthood was William Henry Coombe (1841-1869, pp. 57-9): he is Bill Addy’s great grandfather. Bill has a substantial collection of information, documents and photographs relating to his Coombe family history. Based on Bill’s records, we need to correct information in The Complete History about who William Henry married. We can also add to the story of this branch of the Coombes. Now evidently in error, The Complete History p. 58 indicates that William Henry married Elizabeth Jane Stephens (nee Prout) in 1864, based on what seemed relevant from on-line parish records. Perhaps this 'other' William Coombe and Elizabeth Jane were the parents of the Elizabeth J. who died in 1869 age nine months (mentioned on p. 59). This child does not appear in any of the Addy family records. From a marriage certificate that Bill Addy sent to us, it is clear that a Redruth Registry marriage (which did not appear in parish church records) is in fact the relevant one: William Henry, miner, married Eliza Jane Spargo, mine labourer aged 24, on April 9 1868 in Redruth. Both were from Frogpool, previously single and both made their mark on the marriage registration. Thus it was Eliza Jane (not Elizabeth, p. 59) who was widowed two and a half years later when William Henry died of consumption, aged only 29, on October 21 1869 (Addy family records) and was buried the next day in Gwennap Burial Ground. The newly-widowed Eliza Jane was pregnant and delivered William Thomas Coombe on December 23 1869 (Addy family records). 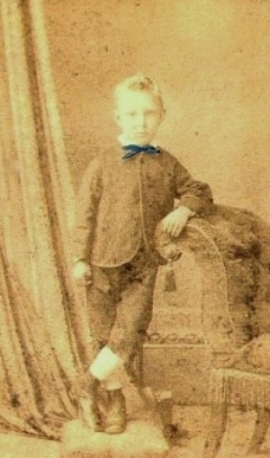 He was baptised the following year on March 13 1870. William Thomas grew up in Frogpool with his mother working as a servant and washerwoman to support them (The Complete History p. 59). From the information provided by Bill Addy, we can now extend the story of William Thomas and his mother. The first photo at right was taken in the 1870s in Cornwall. In his late teens, William (who seems not to have used his middle name Thomas) apparently showed an avocation for the church and began training for the ministry. In July 1889 he left England and after a voyage of about eleven days arrived in New York on July 21 1889. He was still only nineteen. Seven weeks later he arrived in Grahamsville, a farming village in New York State about 180 km north of New York City. Next day he was preaching in the local Dutch Reformed Church. In the following year, he brought his mother, Eliza Jane, from Cornwall to America and she lived her last seventeen years with William’s family in NY and New Jersey. William (photograph when he was in his thirties, at right) was formally ordained by the church in 1892 and eventually settled - for twenty-seven years – at the Presbyterian Church in Kearny, NJ. He married a Grahamsville girl, Charlotte Lamoree the daughter of a doctor, and their children included Bill Addy’s mother, Mary. William loved the hilly farming country round Grahamsville and in 1909 bought a farm there which he turned into a summer home (photograph below) for his children and grandchildren. Reverend William Coombe retired in 1937 but continued as minister for Dutch Reformed churches around Ellenville NY, where he died aged 86 in 1956. He is buried in a Coombe plot in the Grahamsville cemetery. His mother, Eliza Jane Coombe (nee Spargo) 1844-1907 (photograph at right) apparently lived the later part of her life in comfortable circumstances after the privations of life as a servant and washerwoman in Cornwall. She was one of fourteen children. All of the twelve who survived childhood emigrated to different parts of the world, seven including Eliza Jane to different parts of the USA, others to Chile, South Africa and one, Caroline Spargo, to South Australia, where she arrived in 1876, married Samuel Miller and lived in North Adelaide and then Western Australia while raising four children.